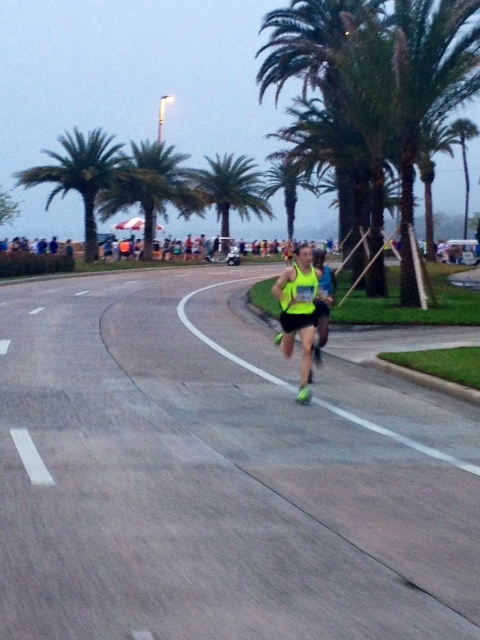 Ryan Vail takes lead in Tampa at mile 12. Tampa, FL. — The excitement of pro racing returned to the streets of Tampa today, as the once legendary Publix Gasparilla Distance Classic saw spirited competitions mark both the pro men’s and women’s races at the 37th running of Tampa’s premier distance events. It was the first time since 1997 that pro prize money was on offer, and Portland, Oregon’s Ryan Vail and Chapel Hill, North Carolina’s Lindsey Scherf came out on top to claim the $80000 first place checks out of a total purse of $40,000. In the 68 degree, 97% humidity conditions Vail’s winning time was 64:06, while Scherf proved her fitness for the March 9th Los Angeles Marathon with a controlled 1:13:07 win. At the dark 6 a.m. start the men took off at more of a marathon tempo, passing the first mile in 5:01, two in 9:51 and three in 14:37 (4:46 mile). Two men led the charge, pulling free from a chase pack of four right off the line. Olympian Abdi Abdirahman of Tucson and Boston Marathon bound Jeff Eggleston of Boulder, Colorado ran shoulder to shoulder for the first six miles as Ryan Vail joined forces with Hanson’s Brooks Distance Project star Bobby Curtis, Boulder, Colorado’s Fernando Cabada and 2013 World Championships Marathon team member Carlos Trujillo. Abdi and Jeff put 12-seconds on the chasers by mile four, then hit Bayshore Boulevard after crossing the Davis Island Bridge, the only hill on the route. With eight miles out and back before them, the two leaders exchanged the lead, hoping to discourage their pursuers. With a half marathon PR of 61:07 and four U.S. 10,000 meter track titles, 36 year-old Abdirahman had by far the best resume, though also the most racing miles in his legs. He’d had to pull out of last December’s Honolulu Marathon with an I.T. band problem, but thought he was ready for his first race of 2014, and spoke of hitting a high-61 minute time, given conducive conditions. “But the weather really got to me at the end,” he said while walking to the award’s ceremony. Abdi broke free of Eggeleston just after six miles, 29:11, but had only built a four second advantage at the turnaround at nine miles. Behind the two leaders Ryan Vail and Bobby Curtis had cut free of Cabada and Trujillo and were eating into the lead with each step. As the course headed back to downtown for the finish Abdi began to go through that good-patch, bad-patch yo-yo that happens mostly in marathons, but can also crop up in rough conditions at lesser distances. Seeing his prey weakened, Vail struck. Between 10 and 11 miles Vail splintered from Curtis, then, at 11 miles he passed Eggleston on the way up to Abdirahman. In the end, Ryan’s 140-mile training weeks gave him enough strength to persevere, and he notched a 12-second win. Bobby Curtis passed Jeff Eggleston for third some seven seconds behind Abdi. Jeff finished in fourth in 64:44. The women’s race was also a two-person affair with marathon trainers Lindsey Scherf and Adriana Nelson going head to head for the first three-quarters of the distance. Throughout the race Lindsey’s smart-watch kept beeping, informing her that she was behind the schedule she had set for herself. After leading for the first four miles, Lindsey eased back and waited for the final stretch to take off. She knew she was heat acclimated having finished third at February 9th San Blas Half Marathon in Coama, Puerto Rico, a legendary race of hills and humidity. 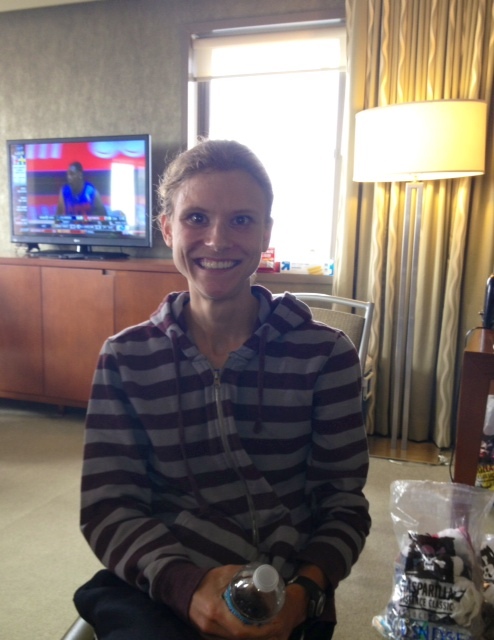 She finished looking strong, and now has her sights set on the L.A. Marathon in two weeks. Boulder, Colorado’s Adriana Nelson is training for the April 21st Boston Marathon, and will build off her runner up time of 1:13:25. Three-time Olympian Jen Rhines finished third in 1:14:38 now representing the Boston Athletic Association, the team her husband Terrence Mahon now coaches. Race fans and organizers showed real enthusiasm for the return of the pro division at Gasparilla, which has one of the great legacies in the sport to build on. Names like Bill Rodgers and Grete Waitz have graced the winner’s podium here in the past. Now we can add Ryan Vail and Lindsey Scherf to that list as the legacy begins anew at the half-marathon distance. In all some 6000 runners took part in today’s half-marathon. Another 4000 ran the 8K, while 5800 did the 15K yesterday along with 14,000 in the 5K. That’s 28,000 runners in all, but just as importantly, the fast kids have returned to one of their old stomping grounds. way to go Lindsay! A long way from those races (and many wins) on the roads when you a teen in Scarsdale. Hoping to see you back on the roads in CT sometime. Great to see an elite field return to Tampa and the Gasparilla Distance Classic. I found the racing in Florida always one of the most meaningfull experiences of my career. Great to see Lindsey Scherf back in the winner’s circle! She won several junior championships and had several top finishes in college, but I think this is her first professional win. Good luck to her in LA! It’s good to see a professional field return to Gasparilla.